This morning there is an old article on my 2do list for translation. 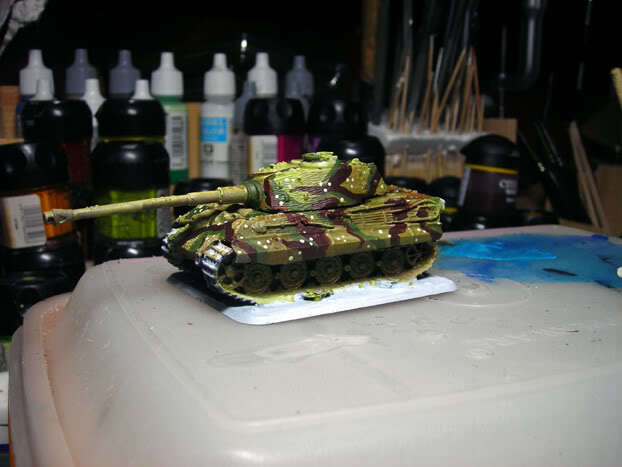 I've painted this Flames of War tank (15 mm) in early 2009 for gaming purposes. 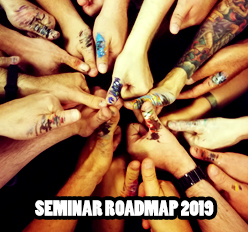 Now follows a little step by step on the stuff i have done. Hope you enjoy, even it is old, you also enjoy me and i am too getting old, so give it a chance. 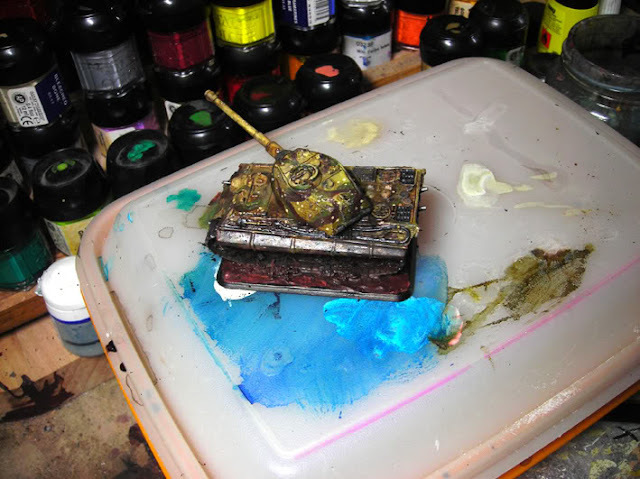 The tank has been primed and i went for the main basecoat on the tank with a mix of Citadels Camo Green, Bleached Bone and a tiny tip of Bestial Brown. 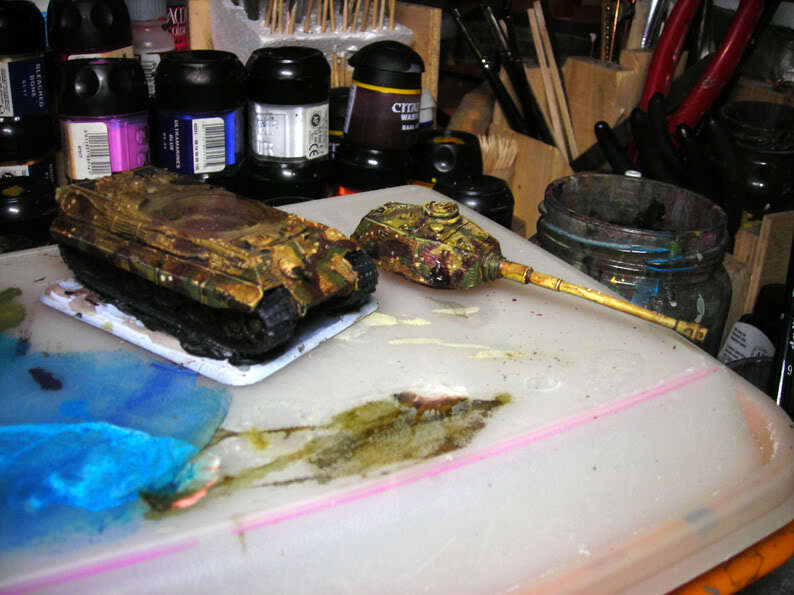 I threw it all together on the model painting wet colours into wet colours. Not mixing it on the wet palette, instead really be brave and throw it all at the model in this step. I plan a video about this technique sooner or later and i hate to say this for years now... there will be one, trust big kong. 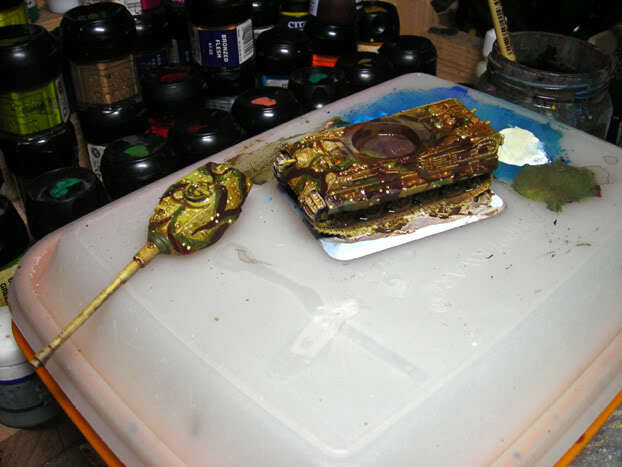 After this was dry i did paint some camouflage with Scorched Brown for the dark brown areas, followed by a mix of Goblin Green + a tiny brush tip of Scorched Brown in it for the green areas (i did this because the goblin green alone would be too bright green!). 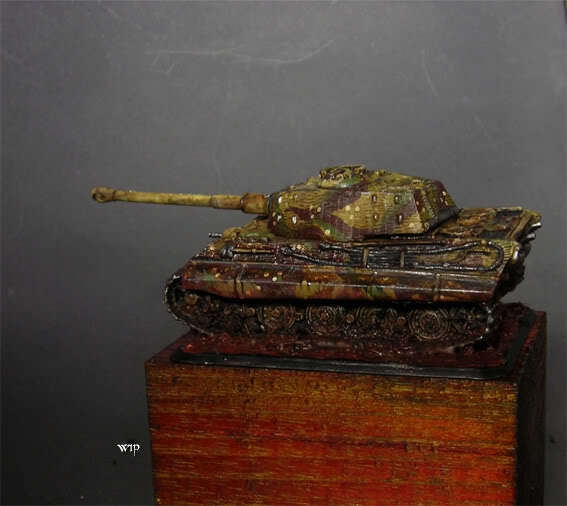 At this point i want to mention that i looked at the german WW2 ambush camouflage pattern, but did not hit it 100% right. The bright dots have been done with Bleached Bone and some white in it. Learning about dotting you can do here. Next step is a big mess, yeah! I used thinned glazes of Vallejo's Smoke and added a tiny drop of an Ink called "Peat Brown" by Windsor&Newton to it. The complete tank was washed with it to bring it all together. Giving this some time to fully dry out. 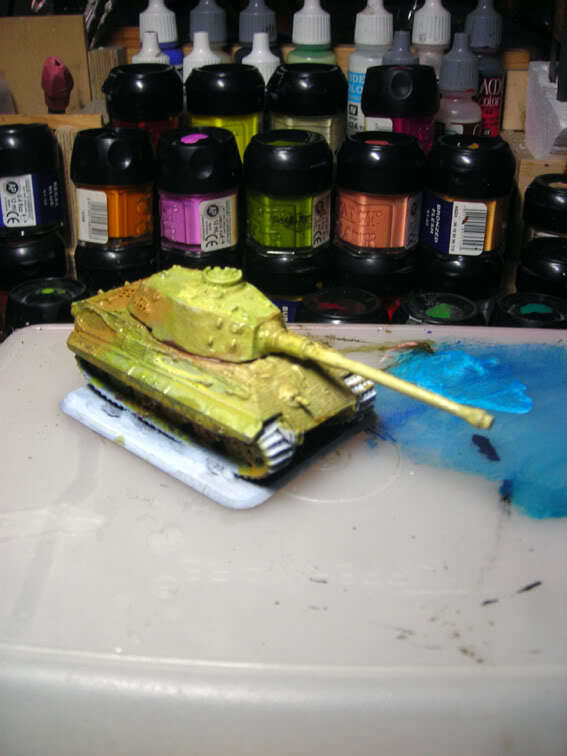 Further work has been done on the dark areas on the tank, like the chains and some minor small parts like tools (remember this is kind of small, 15 mm). I took some black with a drop of grey in it for this work. 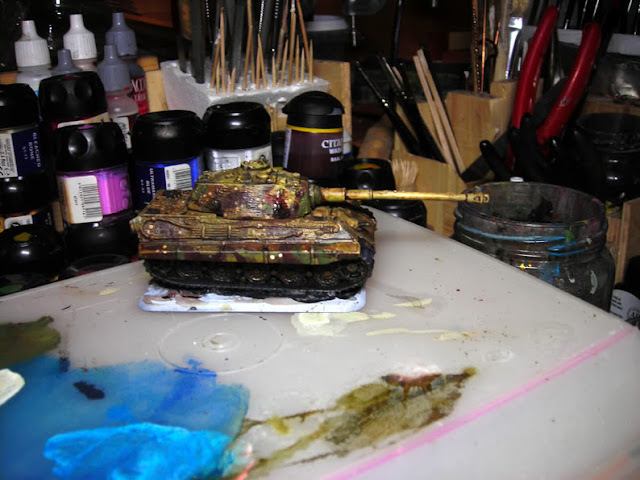 The tank's tower is removable at this moment so i can reach every place with paint. I did use some dark metal colour to work on the metal parts. Now it was time for the grounding. I took some common earth and mixed it together with gloss varnish + Scorched Brown and brought it up to the base. The varnish inside this mix keeps everything in place. Final steps on this gaming model has been a decal, which i put in place and later on glazed with the remains of the smoke mix to make it look more weathered. I put my attention to the small details like chains and the tools again and spent some time on them to seperate them from the other areas with darker lines. You can see an old method on snow i was using back then, but i don't like it at all - i would recommand making snow the following way for better results. 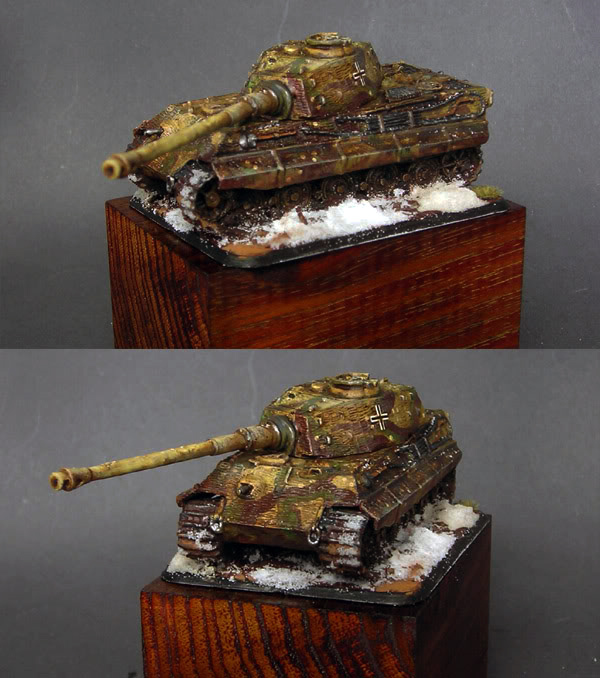 Quick and fast article about a Flames of War tank - hope you like it! The colorsheme chosen a tad too dark and noisy for me- if you know what I mean. But thanks for the step by step, I like it. May I say something? I use black or brown Vallejo glaze instead of smoke. For me it has a better and smoother effect. Smoke darkens to much and shines a little bit.